Automatically triggering a build after each check-in (continuous integration option in TFS Build Definitions) in a development branch is a good practice that nowadays needs less explanation than a few years ago. Many development teams seem to adopt this practice quite well, but there’s still a lot of room for improvement. The main benefit of enabling continuous (integration) builds is clear: providing early feedback on the validity of the latest code changes that were committed to the version control repository. I won’t discuss in detail the different checks (compilation, deploy, test) that should be part of the validation step (as always: it depends! ), but for this post I want to focus mainly on the importance of having at least a continuous (integration) build. 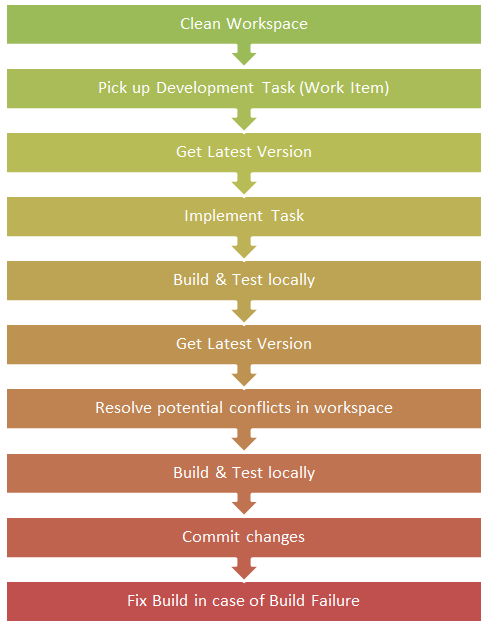 A future topic to tackle is how to get your CI builds as fast as possible with TFS 2010. The first guideline that developers should follow if they want to reap the full benefits of CI builds, is to check-in early and often. I’m often worried/shocked when developers show me the amount of pending changes in their local workspace. This nearly always leads to the conclusion that those developers are working on many different tasks at the same time which should be avoided at all cost. The risk of committing unwanted files for a dedicated change is just too high. There are a number of version control features available to safely switch to another task: shelving or creating an extra workspace. The next version of TFS (TFS11) will even include better support for task-driven development through a revised Team Explorer (more details in this blog post of Brian Harry). Check-in early and often does of course not mean that developers must just check-in changes that are not ready yet and not locally validated, but it does mean that developers should work on small incremental changes. This requires every involved developer to break down their assigned work into small tasks which may result in a check-in operation. Ideally, as a developer, you should commit your changes to the version control repository at least daily. And don’t forget to provide a decent comment for the check-in operation in addition to an association with a work item. This meta-data might become quite important in some merging scenarios. Having a CI build and adopting a check-in early and often policy, will lead to the fact that a broken build can only be caused by an incremental small change which should be easier to fix than a large changeset or a combination of multiple changesets by different developers. More frequent check-ins will further decrease the amount of files that could be part of a conflicting changeset that caused the build to fail. Another golden rule in a CI environment is to fix the broken build as soon as possible and to delay other commits of pending changes. This implies that a notification mechanism should be put in place to warn the development team about broken builds. In Team Foundation Server 2010, you can easily set up an e-mail alert or you can rely on the built-in Build Notifications tool. The developer who caused the build to fail must take responsibility to fix it immediately. The check-in operation of a developer can only be considered as completed/done when the CI build has built successfully the latest changeset. After the last step, you may start all over again or you may just go home! Committing changes to version control requires you at least to wait until the CI build has finished successfully. Do you really want to impact the entire development team by going home without verifying your latest changes? This reminds me to my early years where I was a junior .NET developer in a mid-sized development team. At that time, there wasn’t yet a proper build server and we never heard of continuous integration before. I don’t have to tell you how many times all developers were impacted by an invalid check-in and how much time we spent on finding the culprit. You probably have all been in a similar situation. Dev1: Who did a check-in recently? Anyone heard of method X? Dev2: I Just did a get latest and everything works fine! Dev3: Are you sure that you took a “real” latest of everything? Dev1: Wait, let me redo a get latest to be sure! Dev4: Damn, I also took a get latest and my build now fails! Dev2: Sorry guys, I might have forgotten to check-in a file! In some cases, the person who caused the build to fail was not at his desk (sick/holiday/meeting) the moment the build failure was discovered! Yeah, those were the times we all never want to go back right? Not to mention what this type of troubleshooting costs! In brief, it’s all about discipline and communication. Having a nice up-to-date build dashboard on a big screen might definitely help to make everyone aware of the importance of the latest build status. In a next blog post I will talk about the importance of the CI build speed. It’s obvious that for providing early feedback, the CI builds must run as fast as possible. What’s the value of a CI build that takes more than 1 hour?! 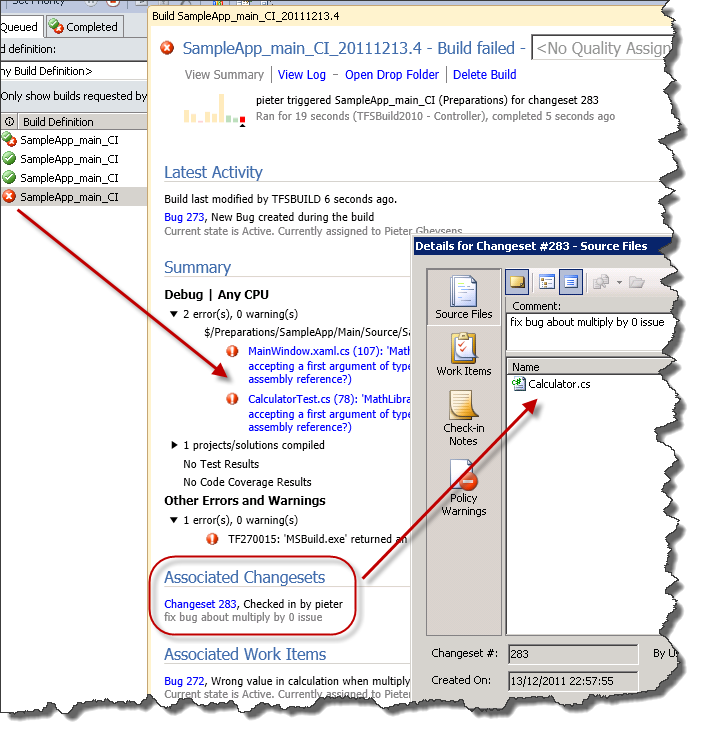 There are some interesting things you can enable in the TFS Build Definitions to optimize CI build definitions. Note that since TFS 2010, there is also the Gated Check-in trigger option that will even prevent broken builds by delaying the actual commit until a successful build was run with the latest code changes in a temporary shelveset.